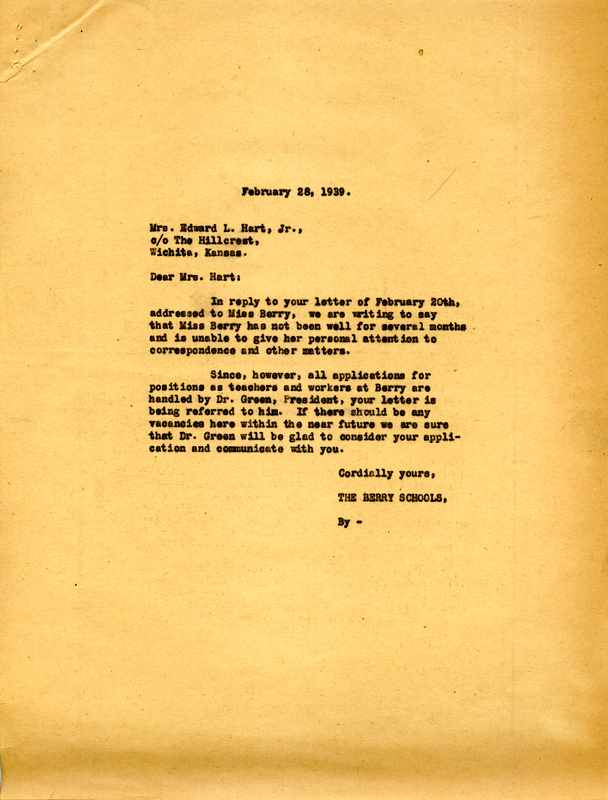 A letter informing Mrs Hart that Miss Martha Berry is unable to respond to personal correspondence due to health reasons, but her letter has been referred to Dr. Green who will consider her application for a position there at Berry. Mrs. Edward L. Hart Jr. The Berry Schools, “Letter to Mrs. Edward L. Hart from The Berry Schools.” Martha Berry Digital Archive. Eds. Schlitz, Stephanie A., Jessica Hornbuckle, Camille Hanner, et al. Mount Berry: Berry College, 2016. accessed April 24, 2019, https://mbda.berry.edu/items/show/15186.